Not to be confused with Tyler County, Texas. Clockwise: Tyler skyline with Plaza Tower at right and People's Petroleum building in center, Cotton Belt Depot, Caldwell Zoo, Chamblee Rose Garden, Smith County Courthouse, Goodman Home. Tyler is the county seat of Smith County, located in east-central Texas, United States. The city of Tyler has long been Smith County's major economic, educational, financial, medical, and cultural hub. The city is named for John Tyler, the tenth President of the United States. Tyler had a population of 96,900 in 2010, according to the United States Census Bureau, and Tyler's 2017 estimated population was 104,991. It is 100 miles (160 km) east-southeast of Dallas. Tyler is the principal city of the Tyler Metropolitan Statistical Area, which had a population of 209,714 in 2010, and is the regional center of the Tyler-Jacksonville combined statistical area, which had a population of 260,559 in 2010. Tyler is known as the "Rose Capital of America" (also the "Rose City" and the "Rose Capital of the World"), a nickname it earned from a long history of rose production, cultivation, and processing. It is home to the largest rose garden in the United States, a 14-acre public garden complex that has over 38,000 rose bushes of at least 500 different varieties. The Tyler Rose Garden is also home to the annual Texas Rose Festival, attracting tourists by the thousands each year in mid-October. Tyler is also home to the Caldwell Zoo and Broadway Square Mall. As a regional educational and technology center, Tyler is the host for more than 20,000 higher-education students, a college of engineering, a university health science center, and two regional hospital systems. In 1985, the international Adopt-a-Highway movement originated in Tyler. After appeals by local Texas Department of Transportation officials, the local Civitan chapter adopted a 2-mi (3-km) stretch of U.S. Highway 69 to maintain. Drivers and other motorists traveling on this segment of US-69 (between Tyler and nearby Lindale) will notice brown road signs that read, "First Adopt-A-Highway in the World." Tyler is located at 32°20′03″N 95°18′00″W﻿ / ﻿32.334249°N 95.299927°W﻿ / 32.334249; -95.299927 at 544 feet (166 m) above sea level. Tyler is surrounded by many smaller cities, including Whitehouse, Lindale, New Chapel Hill, Bullard, Edom, Brownsboro, Kilgore, Flint, and Chandler. According to the United States Census Bureau, the city has a total area of 54.4 square miles (140.8 km2), of which 54.2 mi2 (140.5 km2) are land and 0.1 mi2(0.3 km2²) is covered by water. Tyler experiences weather typical of East Texas, which is unpredictable, especially in the spring. All of East Texas has the humid subtropical climate typical of the American South. The record high for Tyler is 115 °F (46 °C), which occurred in 2011. The record low for Tyler is −3 °F (−19 °C), which occurred on January 18, 1930. As of the 2010 census, 96,900 people resided in the city of Tyler, Texas. The population density was 1,782.0 people per square mile (688.0/km²). The 41,742 housing units averaged a density of 716.7 per mi2(276.7/km²). The racial makeup of the city was: 60.5% White, 24.8% Black, 0.5% Native American, 1.9% Asian, 0.03% Pacific Islander, 10.3% from other races, and 2.0% from two or more races. About 21.2% of the population were Hispanic or Latino of any race. The median income for the city was $42,752 and the poverty rate was 19.5%. Legal recognition of Tyler was initiated by an act of the state legislature on April 11, 1846. Texas created Smith County and authorized a county seat. The first plat designated a 28-block town site centered by a main square, located within a 100-acre tract acquired by Smith County on February 6, 1847. The new town was named for President John Tyler, who advocated for annexation of Texas by the United States. A log building on the north side of the square functioned as courthouse and public meeting hall until it was displaced by a brick courthouse in 1852. On January 29, 1850, Tyler was incorporated. Early religious and social institutions included the First Baptist church and a Methodist church, a Masonic Lodge and an Odd Fellows Lodge, and Tyler’s first newspaper. Though Tyler’s early economy (1847–1873) was based on agriculture, it was also well-diversified during this period. Logging was a second major industry, while complementary manufacturing included metal working, milling wood, and leather tanning. As the seat of Smith County, the town also benefited from government activity. The local agricultural economy relied on slave labor before the Civil War. By 1860, Tyler held over 1000 enslaved persons, which represented 35 percent of the town’s population. So there was strong support for secession and the Confederacy within Tyler, as a high percentage of its residents voted for secession and many of its men joined the Confederate Army. The town was secure enough for the Confederacy to establish the largest ordnance plant in Texas. In 1870, the first bank in Tyler was established by Bonner and Williams. Though both the Texas and Pacific Railroad and the International Railroad (Texas) eschewed routes through Tyler, the town gained an important rail connection when the Houston and Great Northern built a branch line in 1874. Toward the end of the nineteenth century, fruit orchards emerged as an important new business in the regional economy. Eighty percent of the county agricultural revenue derived from cotton as it persisted as the dominant crop in the first decades of the twentieth century. Peaches were the principal fruit crop as the county fruit tree inventory surpassed one million by 1900. Disease struck the peach trees, though, and local farmers moved toward growing roses by the 1920s. Twenty years later, most of the US rose supply originated in the Tyler area. According to the city's most recent Comprehensive Annual Financial Report, the city's various funds had $87.7 million in revenues, $101.7 million in expenditures, $49.2 million in total assets, $12.3 million in total liabilities, and $17.6 million in cash in investments. The Northeast Texas Public Health District is a political subdivision under the State of Texas established by the City of Tyler and Smith County. In place for nearly 70 years, the Health District became a separate entity in 1994, with an administrative Public Health Board. With a stated vision "To be the Healthiest Community in Texas", the district has a full-time staff of over 130 employees. The Health District has a broad range of services and responsibilities dedicated to their mission: "To Protect, Promote, and Provide for the Health of Our Community." In June 2015, City Manager Edward Broussard canceled a scheduled appearance of Lou Ann Smoot, a local LGBT activist, at the Tyler Public Library. He said there was a possibility that children might attend her book talk. Tyler is represented in the Texas Senate by Republican Bryan Hughes, District 1, and in the Texas House of Representatives by Republican Matt Schaefer, District 6. The Texas Twelfth Court of Appeals is located in Tyler. The Texas Department of Criminal Justice operates the Region I Parole Division Office and the Tyler District Parole Office in Tyler. The two U.S. Senators from Texas are Republicans John Cornyn and Ted Cruz. Tyler is part of Texas' 1st congressional district, which is currently represented by Republican Louie Gohmert. The United States Postal Service operates several post offices in Tyler, including Tyler, Azalea, Southeast Crossing, and the South Tyler Annex. 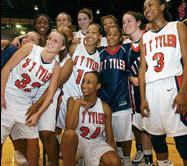 Tyler's higher education institutions include the University of Texas at Tyler and the University of Texas Health Center at Tyler, both part of the University of Texas System, as well as Texas College, the city's only HBCU, and Tyler Junior College. Public primary and secondary education for much of the city is provided by the Tyler Independent School District, which includes high schools John Tyler and Robert E. Lee, as well as Premier High School of Tyler, a public charter school (Cumberland Academy). Several Tyler schools offer international baccalaureate and advanced placement programs. Portions of incorporated Tyler are served by surrounding school districts. These include sections of southeast Tyler, served by the Whitehouse Independent School District, and some sections in the east which are served by the Chapel Hill Independent School District. There are also private schools in Tyler, including Grace Community School (Texas), All Saints Episcopal School, Seventh-day Adventist Church School, King's Academy Christian School, Kingdom Life Academy (Located in the same building but not affiliated with King's Academy), Christian Heritage School, East Texas Christian Academy, and Good Shepherd Reformed Episcopal School. The Brook Hill School in nearby Bullard, TX is also served by the Tyler Independent School District. The Tyler Catholic School System of the Catholic Diocese of Tyler consists of St. Gregory Cathedral School and Bishop Thomas K. Gorman Regional Catholic Middle and High School. In addition to its role in the rose-growing industry, Tyler is the headquarters for Brookshire Grocery Company, which operates Brookshire's, Fresh, Super 1 Foods, and Spring Market supermarkets in three states (Texas, Louisiana, and Arkansas). The company's main distribution center is located in south Tyler, while SouthWest Foods, a subsidiary that processes dairy products, is located just northeast of the city. Annually, the Texas Rose Festival draws thousands of tourists to Tyler. The festival, which celebrates the role of the rose-growing industry in the local economy, is held in October and features a parade, the coronation of the Rose Queen, and other civic events. The Rose Museum features the history of the Festival. Tyler is also home to Caldwell Zoo, several local museums, Lake Palestine, Lake Tyler, and numerous golf courses and country clubs. A few miles away in Flint, TX is The WaterPark @ The Villages, a year-round, indoor water park. There is also an "Azalea Trail" in Tyler, which consists of two officially designated routes within the city that showcase homes or other landscaped venues adorned with azalea shrubs. The Azalea Trail also is home to the long-standing tradition of the Azalea Belles. The official greeters of the Azalea Trail are known as the Azalea Belles, young women from the Tyler area who dress in antebellum gowns. The belles are chosen each year from area high schools or home school families, and it is an honor to be chosen. Tyler State Park, located a few miles North of the city limits, attracts visitors with opportunities to camp, canoe, and paddle boat on the lake. Other available pastimes include picnicking, boating (motors allowed – 5 mph speed limit), boat rentals, fishing, birding, hiking, mountain biking, hiking trails, lake swimming (in unsupervised swimming area), and nature study. The Smith County Historical Society operates a museum and archives in the old Carnegie Library. The East Texas State Fair is held annually in Tyler. Lake Tyler was the location of the HGTV Dream Home contest in 2005. The 6,500 square feet (600 m²) house helped to boost tourism and interest in the community and surrounding areas. It was subsequently sold at public auction in January 2008, for $1.325 million. The Smith County Historical Society building is located across the street from the Tyler Public Library. Tyler has a Cotton Belt Railroad Depot Museum located near the Chamber of Commerce office. The Smith County Historical Society, a 501(c)(3) non-profit organization, was founded in 1959 by individuals and business firms dedicated to discovering, collecting, and preserving data, records, and other items relating to the history of Smith County, Texas. The Society operates a museum and archives, which is located in the former Carnegie Public Library building in downtown Tyler. Permanent museum exhibits include life-size dioramas of Smith County history, with topics ranging from the Caddo Indians to the 20th century. Other items from the Society's collections are showcased in revolving, temporary exhibits. The Society's archival library contains historical artifacts of Smith County, including newspapers, city directories, school records, photographs, maps, historical papers and rare books. The archives are open to the public for research on a limited schedule with volunteer staff on duty. The society is also the official caretaker of Camp Ford Historic Park. Camp Ford was the largest Confederate Prisoner of War camp west of the Mississippi River during the American Civil War. The original site of the camp stockade is a public historic park managed by the Smith County Historical Society. The park contains a kiosk, paved trail, interpretive signage, a cabin reconstruction, and a picnic area. It is located on Highway 271, 0.8 miles (1.3 km) north of Loop 323. 2018 marks the 50th anniversary of Tyler's Civic Chorale. Aerial photo of Tyler Pounds Regional Airport in Tyler, Texas, shot by Butler Planning Services on 9/9/2005. The most common form of transportation is the motor vehicle. Tyler is a nexus of several major highways. Interstate 20 runs along the north edge of the city going east and west, U.S. Highway 69 runs north–south through the center of town and State Highway 64 runs east–west through the city. Tyler also has access to U.S. Highway 271, State Highway 31, State Highway 155, and State Highway 110. Loop 323 was established in 1957 and encircles the city, which has continued to grow outside of this loop. Loop 49 is a limited access "outer loop" around the city and currently runs from State Highway 110 south of Tyler to Interstate 20 northwest of Tyler. Loop 124 is 1.5 miles long. Tyler Transit provides customers with public transportation service within the City of Tyler. The buses run daily, excluding Sundays and holidays. Tyler Transit offers customers the option to purchase tickets, tokens, or passes at the Tyler Transit office, located at 210 E. Oakwood Street inside the Cotton Belt Railroad Depot at the main transfer point. The City of Tyler paratransit service is a shared-ride, public transportation service. Requests for service must be made the day before the service is needed. Trips can be scheduled up to 14 days in advance. ADA compliant paratransit service is provided to all origins and destinations within the service area defined as the city limits of Tyler. Greyhound Lines bus service is available through a downtown terminal. Tyler Pounds Regional Airport offers service to Dallas-Fort Worth International Airport via American Eagle. General Aviation services are provided by two fixed-base operators, Johnson Aviation and the Jet Center of Tyler. Starting July 2nd, 2019, Frontier will start service to Denver. 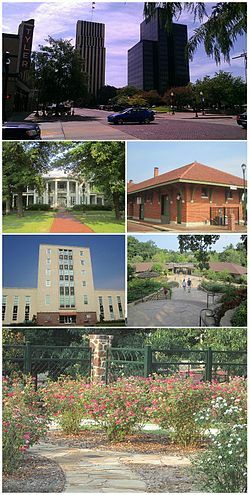 Tyler was the hub for a series of short-line railroads which later evolved into the St. Louis Southwestern Railway, better known as "The Cotton Belt Route". This line later became part of the Southern Pacific Railroad, which itself merged with the Union Pacific Railroad, which continues to serve the city today. No passenger train service to Tyler has occurred since April 1956, but Amtrak runs through the city of Mineola, a short distance north of Tyler. A 2014 study by Walk Score ranked Tyler with a walkability score of 32 (out of 100) with some amenities within walking distance. Hospitals located in Tyler include UT Health Tyler, Trinity Mother Frances Health System, UT Health North Campus Tyler, and Texas Spine & Joint Hospital. There are also many clinics including the Direct Care Clinic. Tyler is the home of many churches, including five large congregations in downtown, the Marvin United Methodist Church, Dayspring United Methodist Church, West Erwin Church of Christ, First Baptist Church, and the Cathedral of the Immaculate Conception. Tyler is also the seat of Catholic Diocese of Tyler, which is particularly noteworthy for its St. Joseph the Worker Parish, one of the few churches in America dedicated to the exclusive use of the Traditional Latin Mass. The parish is staffed by the Priestly Fraternity of St. Peter. The city also is the home of the Cathedral of the Immaculate Conception and the Sanctuary of Our Lady of Mount Carmel, a 100-plus year sanctuary recently renovated and declared a historic and heritage site by the Catholic Diocese of Tyler. The Saint Peter Claver Parish, located in central Tyler, is the second largest Catholic Church in Tyler and was dedicated to St. Peter Claver, a Franciscan priest that assisted the black slaves in Brazil during the slave trade to South America. There is also a Nazarene church on Old Bullard Road, called Tyler First Church Of The Nazarene. The city also has a Chapel of The Church of Jesus Christ Of Latter Day Saints. Tyler has three United Pentecostal Churches; the largest of them is Tyler Tabernacle located just outside of Loop 323. Park Heights Assembly of God is another and also located just outside Loop 323. The Our Lady of Guadalupe Catholic church in East Tyler is also a major center of gathering. The St. Peter and Paul Chapel, a Catholic church, is located next to the Bishop Thomas K. Gorman Regional Catholic School, was constructed and dedicated in 2011, and holds masses in English and Spanish with a significant number of other services offered to all Tyler and neighboring residents. The city's largest church, Green Acres Baptist Church, is located on Troup Highway in southeast Tyler. Tyler is also home to two reformed Baptist churches, Sylvania Church and Living Acts Church, both of which are located in the south Tyler area. Additionally, Tyler has two Jewish houses of prayer, Ahavath Achim, which associates itself with Conservative Judaism and Beth El which adheres to Reform Judaism. Tyler is also home to East Texas Islamic Society, established in 1988, which includes an Islamic house of worship and an Islamic school for children. There's also a Unitarian, Universalist Fellowship on Old Omen Road and Cross Brand Cowboy Church at 11915 FM-2015 Tyler, Texas. The oldest continuously active church in Smith County is the historic 152 year old New Harmony Baptist Church, which is located about 10 miles outside of Tyler at 10251 FM 724 Tyler, TX 75704. Two Tyler churches were destroyed during the 2010 East Texas church burnings. Currently, 18 media outlets and one newspaper are located in Tyler, as well as many more in the surrounding areas. On the evening of February 2, 2009, a fire engulfed a number of historic buildings located in downtown Tyler. Eight different fire departments responded to the fire. The 1982 Supreme Court case Plyler v. Doe, which prohibited denying schooling to immigrant children, originated in the Tyler Independent School District. Robert E. Mead founded what later became known as Silverleaf Resorts in Tyler in 1977. The Tyler courthouse shooting was on February 24, 2005, when David Arroyo fatally shot his ex-wife and a man in the Tyler Square on the Smith County Courthouse. Jere Locke Beasley – (born 1935), born in Tyler, he was the 22nd Lieutenant Governor of Alabama when Governor George Corley Wallace was shot and severely injured in an assassination attempt in Laurel, Maryland, on May 15, 1972. Beasley, a Democrat, hence served as the acting governor of Alabama from June 5 to July 7, 1972. Frank Melton (1949-2009) – former mayor of Jackson, Mississippi (2005–2009), and former broadcast journalist and general manager of KLTV in Tyler in 1977. Albert Parsons (1848-1887) – pioneer American socialist and later anarchist newspaper editor, orator, and labor activist. Parsons was one of four Chicago radical leaders controversially convicted of conspiracy and hanged following a bomb attack on police remembered as the Haymarket affair. He resided in Tyler, Texas where he was reared by his eldest brother, William Henry Parsons, however Parson's moved the family moved from Tyler in the mid-1850s. William Steger (1920-2006) – Republican U.S. District Court judge for the Eastern District of Texas, based in Tyler, from 1970 until his death. The William M. Steger Federal Building and United States Courthouse in Tyler was named in his honor in 2006. Allen R. Morris – he is an Emmy Award-winning producer/director/writer. For a period, he worked for Buford Television at KLTV in Tyler, as Operations Manager and Director of Creative Services, during which time he was also a frequent actor at the Tyler Civic Theatre (1979 to 1990). Ned Touchstone (1926–1988) – born in Florien, Louisiana, newspaper publisher who was a figure in the "Radical Right" in Louisiana politics during the 1960s. At the time of death, he resided on Lake Palestine near Tyler. James T. Draper, Jr. – president of the Southern Baptist Convention from 1982 to 1984, was a pastor in Tyler in the early 1960s. Josh Byerly – NASA spokesman and one of the "voices of Mission Control"
Winston C. Hackett - A native of Tyler, who became the first African-American physician in Arizona. Brian Werner – Conservationist, co-founder of Tiger Creek Wildlife Refuge, located near Tyler. ^ "American FactFinder". U.S. Census Bureau. Retrieved October 24, 2014. ^ "Tyler, TX: population, 1-year ACS". Census Reporter. Retrieved November 3, 2018. ^ a b c "Quick Facts: Tyler, city, Texas". US Census Bureau. Retrieved November 3, 2018. ^ Tyler Convention & Visitors Bureau. "Welcome to Tyler, Texas". Retrieved April 10, 2017. ^ a b Recreation, City of Tyler – Parks and. "City of Tyler – Parks and Recreation > Park Directory > Tyler Rose Garden". parksandrec.cityoftyler.org. Retrieved 2016-10-14. ^ United States Census Bureau. "Census of Population and Housing". Retrieved October 17, 2016. ^ a b c Long, Christopher (June 15, 2010). "TYLER, TX". Handbook of Texas Online. Texas State Historical Association. Retrieved November 3, 2018. ^ Williams, Diane Elizabeth (20 June 2001). "National Register of Historic Places Form: People's National Bank Building" (PDF). Texas Historic Sites Atlas. p. 7. Retrieved 3 November 2018. ^ City of Tyler CAFR. Retrieved 2009-06-07. ^ a b c "Former Tyler Mayors". Cityoftyler.org. City of Tyler. Retrieved April 15, 2017. ^ Robert W. Glover; Linda Brown Cross, eds. (1976). Tyler & Smith County, Texas: An Historical Survey. American Bicentennial Committee of Tyler-Smith County – via University of North Texas Libraries. ^ a b Lawrence Kestenbaum (ed.). "Mayors of Tyler, Texas". Political Graveyard. Retrieved April 15, 2017. ^ "City of Tyler Mayor". Tylertexas.com. Archived from the original on February 27, 1997 – via Internet Archive, Wayback Machine. ^ "Mayor". Cityoftyler.org. City of Tyler. Retrieved April 15, 2017. ^ Northeast Texas Public Health District website. Retrieved 2009-08-18. ^ "Contact Information." Twelfth Eleventh Court of Appeals. Retrieved on March 10, 2010. ^ "Parole Division Region I Archived 2011-09-28 at the Wayback Machine." Texas Department of Criminal Justice. Retrieved on May 15, 2010. ^ "Post Office Location – TYLER." United States Postal Service. Retrieved on May 15, 2010. ^ "Post Office Location – AZALEA." United States Postal Service. Retrieved on May 15, 2010. ^ "Post Office Location – SOUTHEAST CROSSING." United States Postal Service. Retrieved on May 15, 2010. ^ "Post Office Location – SOUTH TYLER ANNEX." United States Postal Service. Retrieved on May 15, 2010. ^ City of Tyler 2012-2013 Comprehensive Annual Financial Report, p. 136. Retrieved 2014-04-11. ^ Navarro, Edward (2006). "It's Tee Time in Tyler". Images of Tyler. Journal Communications, Inc. 1: 57. ^ "Frequently Asked Questions". Tyler Azalea Trail. Archived from the original on 2012-11-30. Retrieved 2012-12-11. ^ "Smith County Historical Society". Smith County Historical Society. Retrieved 2012-12-11. ^ "East Texas State Fair". Etstatefair.com. Retrieved 2012-12-11. ^ "HGTV Dream Home Sold, $1.325 Million". Kltv.com. Retrieved 2012-12-11. ^ "Our History". www.tylercivicchorale.org. 2018-05-15. Retrieved 2018-05-15. ^ "Tyler Transit". Cityoftyler.org. Retrieved 2012-12-11. ^ "City and Neighborhood Rankings". Walk Score. 2014. Retrieved April 11, 2014. ^ "East Texas Islamic Society". Tylermuslims.com. 1988-05-29. Archived from the original on 2013-03-15. Retrieved 2012-12-11. ^ "History Lesson 10: Plyler v. Doe: Can States Deny Public Benefits to Illegal Immigrants?". www.crfimmigrationed.org. Retrieved 2018-09-13. ^ "An Update From Max". blogs.myspace.com/sayanything. 2009-05-20. Archived from the original on 2012-12-02. Retrieved 2009-05-21. ^ "The Man Who Made Wildly Imaginative, Gloriously Disobedient Buildings". The New York Times. 2018-09-10. Retrieved 2018-09-13. ^ a b c d e "Interactive City Directory". Sister Cities International. McDonald, Archie P. Historic Smith County (Historical Publishing Network, 2006). Reed, Robert E. Jr. Images of America: Tyler (Arcadia Publishing, 2008). Reed, Robert E. Jr. Postcard History: Tyler (Arcadia Publishing, 2009). Wikivoyage has a travel guide for Tyler. Wikisource has the text of The New Student's Reference Work article about "Tyler, Texas". This page was last edited on 19 April 2019, at 19:20 (UTC).